Our winery is located 1800’ atop the Mayacamus Mountains. We have a spectacular views of Napa and Sonoma Valleys and the majestic Golden Gate Bridge. Our vineyards are managed under the caring and watchful eye of Phil Coturri. Phil’s philosophy is in sustainable organic farming. Our estate Cabernet Sauvignon and Syrah are nestled above the fog line in premier south-facing volcanic slopes. 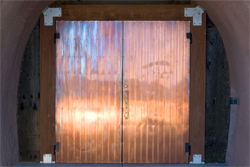 Our cave doors add to the collection of unique winery doors in wine country. We are amongst the privileged few to incorporate a cave at our winery. This allows us to have perfect storage conditions for our wines.